Supporters call for justice for imprisoned rapper Meek Mill during a rally outside the Criminal Justice Center November 13, 2017. 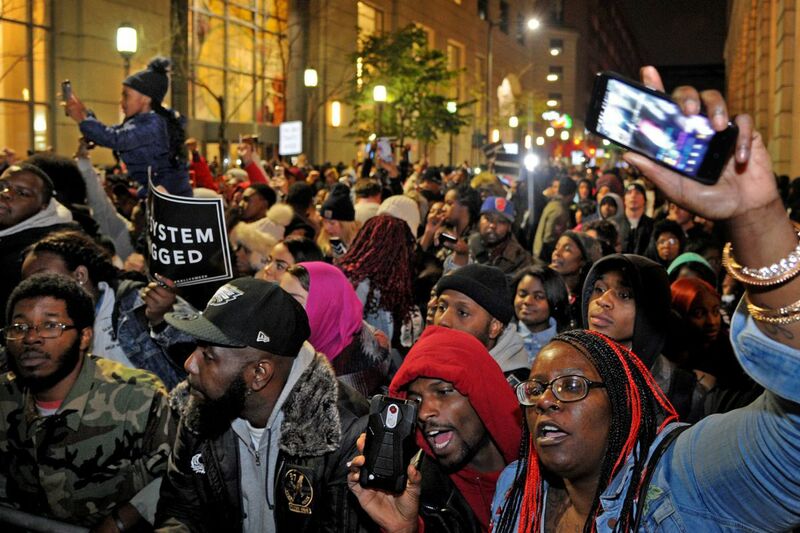 Hundreds of supporters of the imprisoned rapper Meek Mill rallied Monday evening outside the Criminal Justice Center, calling for his sentence to be overturned and attacking a system they say failed him and others. Speakers at the 5 p.m. demonstration included 76ers legend Julius Erving, Eagles safety Malcolm Jenkins, and rappers Rick Ross and Freeway. Erving, wearing a raincoat and hat, was the first big-name attendee to address the boisterous crowd. He quoted the Rev. Dr. Martin Luther King Jr: "Injustice anywhere is a threat to justice everywhere." Mill was sentenced last week to two to four years in prison for violating probation resulting from a 2008 gun and drug case. His critics have lashed out at the sentencing judge, Common Pleas Court Judge Genece Brinkley, and his defense lawyers have pledged to appeal, although no such challenge has been filed. Since his sentencing, Mill has had a number of prominent backers speak against his incarceration, including Jay-Z and other music figures. A Change.org petition calling for a review of Mill's pardon application has over 342,000 signatures. The judge revoked the North Philadelphia native's probation following fresh arrests for probation violations. He pleaded guilty in October to reckless driving charges in Manhattan after driving a dirt bike on city streets. He was also arrested for fighting in St. Louis in March, but those charges were dropped. Neither the prosecutor nor Mill's probation officer recommended prison time for the violations. Former Philadelphia 76ers Julius “Dr. J.” Erving (second from right) waits to speak to supporters calling for justice for imprisoned rapper Meek Mill during a rally outside the Criminal Justice Center November 13, 2017. Erving said Mill's sentence "was excessive, was cruel, was motivated by unsavory circumstances." Ross told the crowd: "It wasn't simply a miscarriage of justice, it was an abortion of justice." Freeway spoke afterward, saying: "You can tell it's something personal with this judge." Jenkins said that injustice, such as what supporters allege about Mill, "erodes the faith of black and brown communities." Hours before it was to begin, word of the rally was spreading fast on social media. One video showed buses with Mill's name plastered on the side. "Sadly there are Black folks going through the same radicalized injustice(s) within the justice system that Meek Mill has experienced for over a decade EVERY SINGLE DAY. This requires more than just gradual reform in laws — It requires a swift overhaul." "I stand for Meek Mill," tweeted fellow Philadelphian Tariq "Black Thought" Trotter of the Roots. "I hope my city does the same." On Saturday, Philadelphia-born comic Kevin Hart joined a chorus of supporters, posting a video to Instagram asking his followers to sign the Change.org petition. We're "really trying to get this sentence re-evaluated," Hart said. "It's just not fair. The man's not perfect … Any time a district attorney and a probation officer says, this man does not deserve to go to jail, do not sentence this guy to jail, and [the judge still does it], it's personal." Eagles safety Malcolm Jenkins posted this to his Twitter account Monday morning, saying he would speak at the rally. Mill's supporters were loud, often making hearing the speakers nearly impossible. Dozens of police officers blocked the entrances to the Criminal Justice Center and the nearby hotels. No arrests were reported. Among the supporters who attended, Sabriya, an artist from South Philadelphia who only gave her first name, said the problem was not merely Mill's sentence, but the system overall. "I came out here to support Meek Mill and make a stand against mass incarceration," Sabriya said. "I think it's amazing for the support. It's a peaceful protest. I wish more people understand how unjust the system is." We're on the scene for the #Justice4Meek rally in Philadelphia, which is protesting Meek Mill's prison sentence. "This is bigger than one man," she said. "If Meek Mill has to be the sacrificial lamb, then so be it." Larriya Rice, a 23-year-old senior at Temple University, echoed the sentiment. "It's not just Meek Mill. It's symbolic of something larger," Rice said. "I expected Philly to come out full throttle. It's just us as a culture. We're aggressive. We fight for what we know is right." Mill is being held at the State Correctional Institution at Camp Hill.